Cyrille Jegu, the speaker of this lecture, French citizen from Britain, is the Executive Director of TNS Asia, and the Ambassador of UK Energy Saving Trust. Cyrille holds an MBA from Macquarie University (Australia), and has completed post-graduate studies on Sustainable Development at Cambridge University (UK) and Blekinge Institute of Technology (Sweden). Although Social Enterprises are quite similar to Businesses, the purpose of Social Enterprises is to fulfill the human needs. Cyrille emphasized, “It’s not about having a car or a fridge. It is not what we need, instead what we want. It is a means to fulfill a need.” Social Enterprises have to fulfill their social mission within the environmental limits. Cyrille explained that the earth is a closed system as far as matter is concerned. Nothing goes in and nothing goes out, and nothing disappears. Everything that we have ever had on this earth is still there but in a different form, increasingly in the form of waste and pollution. He also explained that the Earth is an open system for energy. There is enough energy from the Sun to fulfill all our energy needs but we need to learn to obtain it more efficiently. Cyrille then showed us a variety of photos and data. One photo of beggars demonstrates that all problems are inter-related within our complex society and cannot be addressed separately, and Systematic thinking is required. To solve the above problem, Cyrille introduced the BACKCASTING approach. It means planning with the future in mind as opposed to forecasting from the past. We can have more flexibility when making decisions in complex situations, especially when facing environmental challenges of tomorrow. 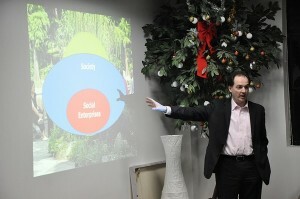 Previous Topic: What is Social Enterprise?